Fabrics For Industry's (FFI) products provide optimum performance in many industry applications. This, coupled with FFI's extensive application knowledge and support team, lets us provide a superior product for your air filtration needs. Fabric filtration is the most reliable method for removing solid contaminants from the air. Fabrics For Industry is recognized as a leader in the manufacturing of filter bags for the baghouse application. We sell many standard replacement filter bags for Dustube Collectors, Shaker, Pulse Jet and Reverse Air baghouses. All filter bags are manufactured here at FFI to meet customer specifications for industrial air pollution control. We have several fabrics to choose from including cotton, polyester, polypropylene, aramid, PPS, Teflon, P-84, homo-polymer acrylic, and fiberglass. These fabrics are carefully selected and tested to meet ASTM/industry standards. Our felt fabrics include conventional polyester, duo-density polyester, aramid, polypropylene, homo-polymer acrylic, PPS and P-84. These felts are carefully selected and come in a variety of finishes. Acid resistant, high temperature felts and fabrics extend service and life in boiler and high chemical applications. Surface cake-release finishes reduce pressure drop. These special fabrics and finishes can be used for problem applications. Fabrics For Industry's product line includes all of the accessories and hardware associated with filter bag requirements. Our accessories include caps, springs, cages, tube hooks, florescent powder, sonic horns, tensioning devices, clamps, J bolts, venturis and precoat. Fabrics for Industry manufactures quality products and provides excellent customer service. They provide excellent documentation and are a very reliable supplier. 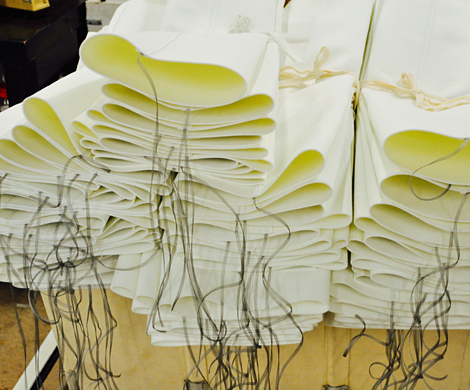 Fabrics for Industry are great to work with and always get the job done correct, and on time!